We just found this wall. We were on our way back to the cars, and there it was. PERFECT. 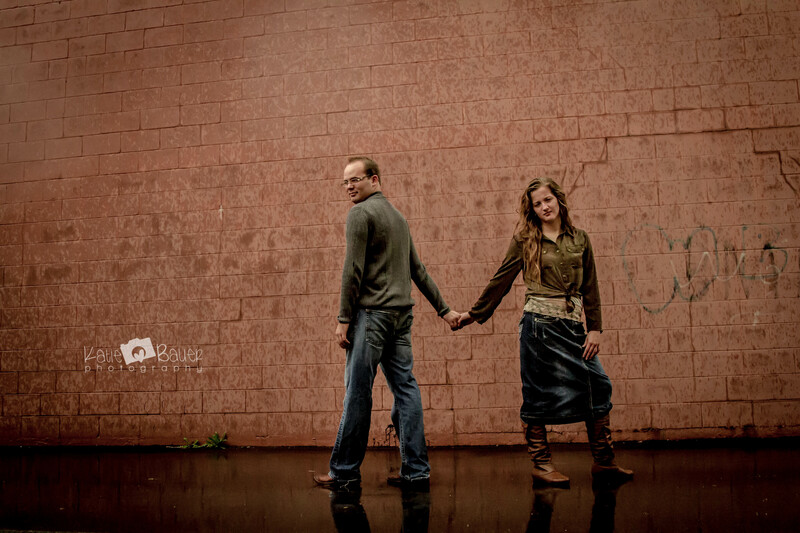 I love the shots I got in front of it, and the rain on the ground and speckled on the wall gave such texture. Ohh what fun we had on this shoot! We found out a couple of days before our shoot that we were expecting some rain (thank you, 10 day forecast), and at first I was a bit panicky. Not really because of the rain itself, but because I wasn’t QUITE prepared for it (I’ve never invested the little bit of money in acquiring rain gear because I hadn’t ran into the need yet), and I didn’t know how Brianne and Caleb would feel about tromping around in the rain while all dolled up and looking snazzy for photos. An added bit of a debacle- Caleb came from Illinois to be there for the shoot, so rescheduling wasn’t exactly an option. After a few minutes though, I got ambitious, and even excited about the prospect of rain! Brianne and I messaged back and forth a few times, decided to deviate from the original plan, and make it an adventure. We were going to meet an hour earlier in case it took a little longer, I was going to rig up a poor-man’s camera cover using a bag and a rubber band (super classy), they were alright with getting a little (or a lot) wet, and we were going to treat it as an opportunity to just work with what we were given. I ended up being able to borrow an actual camera rain bag from my parents’ neighbors, so that was definitely a help. We did start out at the original location we planned on- Mounds Park. Definitely one of my favorite locations-I should probably broaden my horizons a bit (and I’m working on that), but it’s hard to skip out on that beauty because of the versatility and the different settings available all in one place. For that matter, I still have yet to venture down to the river during a shoot there! Also, Caleb had proposed to Brianne at Mounds Park, so it held sentimental value, and I’m sure you know by now how much that sentimental value gets to me. I just can’t resist it. I get so gooey inside. Anyway, the day of the shoot, I woke up earlier than normal to prepare and keep an eye on the forecast. It was bright and sunny, and I started getting a little disappointed, thinking I wasn’t going to get that rainy challenge after all. We met at Mounds Park and started our shoot. The sky started getting a bit overcast, and we felt a few drops at the beginning, but as a whole, it held out for a while for us. And then it decided it was done holding out. We shot a few more shots at Mounds, and then ventured to downtown Anderson, where I’d seen a building wall I’d been dying to use for the past couple of weeks. Actually, it’s the side of a building my husband has been telling me about for years- A place called Jamz used to be inside (I guess it was some sort of lounge thing? With musical performances? I don’t know, I never experienced it while it was alive). He’s always had this fantasy of buying the building and turning it into a venue. Apparently it was pretty classy back in the day! ANYWAY. We used the side of the Jamz building for some of the first shots, and then decided to just stroll around downtown. The rain wasn’t pelting us, but we definitely weren’t dry- my poor shoes had to recover this week. I typically don’t use an umbrella when it rains (nope, I don’t melt, and I’m generally not too concerned with my hair since I don’t know how to style it to begin with), and since I had the rain bag, I didn’t really need one, so I was able to let them use my brand new cute little umbrella, and I love how it looked in some of the shots. And ohh goodness. Brianne and Caleb were wonderful! The love between them was phenomenal (I’ve said it before, and I’ll say it 1,000,000,000 more times- THAT is what makes a photo really pop! ), they were adventurous, fun, and silly together. Brianne had some great ideas for me for shots, and they were both so willing to do whatever I wanted them to in order to get the shot. I must admit- I often feel bad about giving my clients a workout they weren’t exactly expecting. Brianne and Caleb were troopers though!